The San Francisco Giants began as the New York Gothams in 1883. In 1885 after an emotional win over Philadelphia, manager Jim Murtie calls his players “giants”. And thus from 1886 onward, the nickname of the club becomes the Giants. During the 1880’s the Gothams/Giants shared the Polo Grounds with a rival NY City club – the Metropolitans. In 1885-86 the Giants sign some of the best players from the Metropolitans, and by 1891 the Giants take over sole possession of the Polo Grounds. After many changes, fires, and renovations to the Polo Grounds, the Giants would share the park with the Yankees from 1913 to 1922. John McGraw was synonymous with the Giants and managed the team from 1902 to 1932. At first he was both player/manager, then he stopped playing at the end of the 1906 season and concentrated on managing the club. Finishing the season with a 106-47 record, the Giants take the pennant over the Cubs by 10 games. In what would have been the second World Series, McGraw and team owner John Brush, (who bought the team in 1902) opt not to play for the “Championship” against the American League winning Boston Red Sox, referring to the new American League as a “minor league”. This was the first of only two times that the World Series would not be played in its history. After some changes to the format of the Series, the Giants face the Philadelphia Athletics the following year. They take the championship 4 games to 1, (with each game being a shutout) for their first World Series crown. 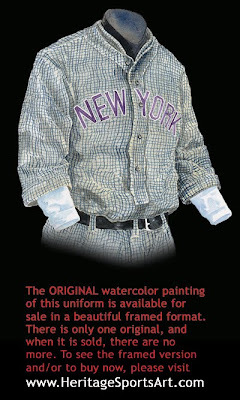 The home uniform we see here is a pullover style, with four buttons down the front. 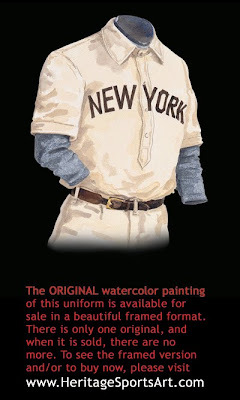 The collar is full, which was the style of the early 1900’s, and “NEW YORK” is boldly spelled out on the front. 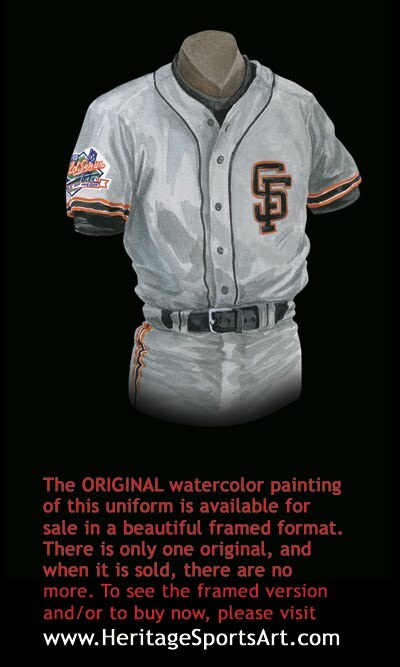 In 1905 the Giants won their first World Series, and in the World Series they chose to wear an alternate uniform to the home and away jerseys they wore during the regular season. 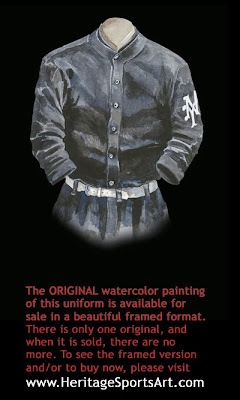 It was an all black uniform with a white NY on the front, and as far as we can tell, this was the first instance of a major league team wearing a 3rd jersey. The 1905 series was the second World Series ever held (the first being in 1903 - what happened in 1904 is a story for another day), and the Giants beat the American League Philadelphia Athletics 4 games to 1 in the first best-of-seven World Series (1903 was best of 9). In 1905 when the Giants won their first World Series, they chose to wear an alternate uniform to the home and away jersey’s they wore during the regular season. It was an all black uniform with a white “NY” on the front. When the Giants returned to the “Fall Classic” this year, they chose to take on the intimidating all black uniform yet again. 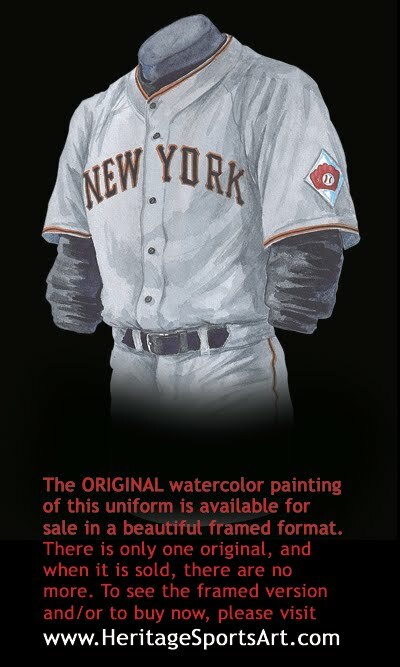 This time the Giants had a new “NY” monogram that was first seen on the 1908 uniform, (the 1908 version was changed the following year to what it looks like now on the New York Mets uniforms). With another winning season of 99-54, the 1911 World Series would be a rematch to that of 1905’s, with the Giants facing the Philadelphia Athletics. After winning game 1, the Giants dropped the next two. The Series was halted for six days due to rain. When game 4 was finally played, one week after the last game, the A’s went back to work and were one game away from the Championship. New York won the next game in 10 innings, but the hurdle was too much to overcome, as they fell to the A’s in the next game, giving Philadelphia the Series. A Giants note from this era: In April 1907 Giants catcher Roger Bresnahan became the first catcher to openly wear protective leg gear. Then in June of the same year Bresnahan is knocked out by a pitch from Reds’ pitcher Andy Coakley. While he recovers, Bresnahan invents the batting helmet, an invention that finally becomes mandatory in 1970. This home uniform was one of four uniforms the Giants had this year. Three out of the four were plaid. This has to be one of the oddest uniforms we have seen. This wide plaid experiment only lasted the one season, with a smaller checkered pattern taking over as the away uniform in the following year. 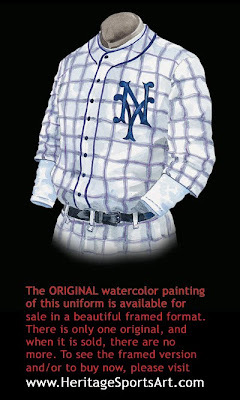 This is a time in baseball when the teams did a lot of experimentation in terms of uniform design and pattern. They would redesign the entire uniform on a seasonal basis. The Giants win a record 26 games in a row this season, but still finish in the middle of the National League standings with an 86-66 record. Note: The 1916 Giants team still holds the Major League Baseball record for most wins in a row - 26! Actually, I believe one of those 26 games ended in a tie, so the record is actually most consecutive games without a defeat. Nonetheless, 26 games without a defeat is a remarkable achievement and one that may be around for another century. 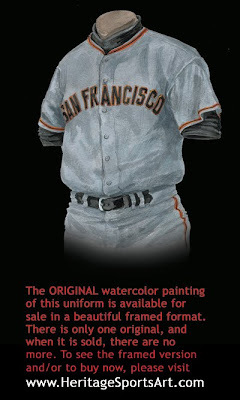 The Giants used this tight cross-hatching road uniform for only one year, but the uniform experimenting was not over as you can see in subsequent uniforms! Note that this jersey features a mini cadet collar instead of the full collar seen earlier. Note also that the “NEW YORK “ on the front of the jersey is purple - quite experimental! Since the Giants last World Series Championship in 1905, they had been to the post season three times, and came up empty in each (they fell to the A’s 4 games to 2 in 1911; 4 games to 3 to the Red Sox in 1912; and 4 games to 1 against the A’s again in 1913). Finishing this season with a 98-56 record (10 games better than the 2nd place Phillies), the Giants found themselves back in the Fall Classic once again, this time against the Chicago White Sox. After coming back from a two games to none deficit to tie the Series, the Giants seemed to be in the driver’s seat leading 5-2 going into the bottom of the 7th in Game 5. But the Sox, led by Eddie Collins, Buck Weaver and Joe Jackson, rallied for an 8-5 Game 5 win, and went on to hand the Giants their fourth straight World Series defeat, 4 games to 2. Note: Eddie Grant was primarily a 3rd baseman who played in the majors from 1905 before joining the Giants partway through the 1913 season. He played for the Giants for 2 ½ years - his last season with the Giants and in the majors was 1915. We mention Eddie here because he was the only big leaguer killed in World War 1, and died in the Argonne Forest in 1918 while leading a rescue mission to save some of his captured colleagues. As a result, on May 30, 1921 the Giants installed a memorial tablet honoring Eddie in center field at the Polo Grounds, and for years afterward if you look closely at some of the great outfield photos from The Polo Grounds, you’ll see this memorial tablet on the far outfield wall. 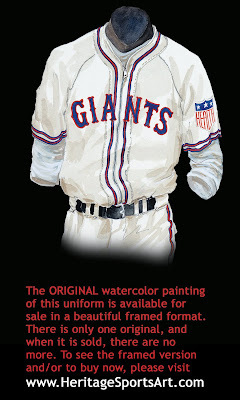 Wide blue and white pinstripes, which the Giants had been flirting with since 1911, covered this home uniform. The “NY” logo is once again on the left arm. The year before this was the first all New York World Series, which was won by the Giants. This years post season saw a re-match, as the Giants finish the season with a 93-61 record. With the Giants already up a game, they went into the second scoring a quick 3 runs in the first. The Yanks came back to tie it, and the game went into extra innings. After the tenth, the game was called due to darkness, although it was still light out. Due to the “tie”, there were actually five games played this Series, although the Giants won the title 4 games to none. The Giants would make appearances in the next two World Series’ as well, but wouldn’t win either. On this home uniform we can see the first use of the colors the Giants wear today, black lettering with orange outlines on a white jersey, and black undershirt. Also we notice the orange piping that goes around the collar and down the buttons, and around the sleeves. These colors would only last three seasons, as they would go back to blue uniforms. In June of 1932 Giants longtime manager John McGraw steps down and passes on the managerial duties to his first baseman Bill Terry. In Terry’s first full season as manager, the team finishes 91-61, and heads to the World Series as underdogs to the Washington Senators. It would be pitching that would decide this series, as the Giants had an impressive 1.53 ERA. New York would take the title in five games. A 1930’s Giants note: On June 15th 1938 the Giants played the first game ever played under the lights in New York, and 23 year old Reds pitcher Johnny Vander Meer pitches a no hitter - amazingly, he pitched another no hitter 4 days earlier vs the Boston Braves. This is the only time the same pitcher pitches back-to-back no hitters in 20th century major league history. The Giants followed one of the trends that took baseball by storm, the zipper. Almost all of the Major League teams embraced this little invention and sported it willingly on the field. The home uniform colors have gone back to the red, white and blue, since the last uniform we saw. The piping around the collar and down the front is more predominant than ever, and is both red and blue. There are even double stripes around the arms. Wartime sleeve patches were worn by all levels of professional baseball teams between 1942 and 1945. A “Health” patch, as seen here, was worn during the 1942 season, part of a war-time health and fitness awareness campaign, and from 1943-1945 a “Stars and Stripes” patch was worn. The Giants appoint yet another player/manager this year in Mel Ott. He would not have as much luck as his predecessors, as the team finishes with a 85-67 record. The Giants seemed to lose more players to the war effort, than any other team. 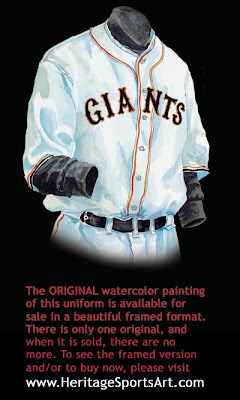 As we see on this road uniform, the Giants have gone back to the colors we saw in the 1933 uniform, and the colors we associate with the modern era Giants. 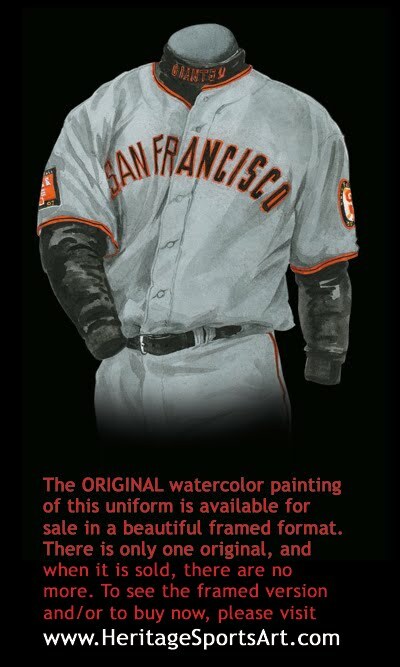 If you look closely, you will see that this Giants uniform has a left sleeve patch. When we first wrote about this uniform some years ago, I asked for help identifying this patch. One reason I asked for help was that the patch was so simple that I simply didn't think it was an anniversary patch or a commemorative patch. Thanks to blog reader Jim McDonnell, we know this to be the National League's 75th anniversary patch (1876-1951). This patch was worn by all National League Teams for the 1951 Season: The New York Giants (Pennant Winners), Brooklyn Dodgers, St. Louis Cardinals, Boston Braves, Philadelphia Phillies, Cincinnati Reds, Pittsburgh Pirates and Chicago Cubs. Here is a 1990's Willabee & Ward reproduction of this National League 75th anniversary patch as worn by all NL teams. Interesting that there are no words or years in this patch - just a very simple, yet attractive design. Compare that patch to the patch American League teams wore in that same 1951 season - in this case a patch celebrating the AL's 50th anniversary (1901 - 1951). 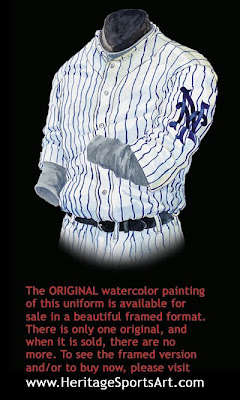 The image below is of an actual 1951 game worn patch, apparently from Mickey Mantle's 1951 uniform. 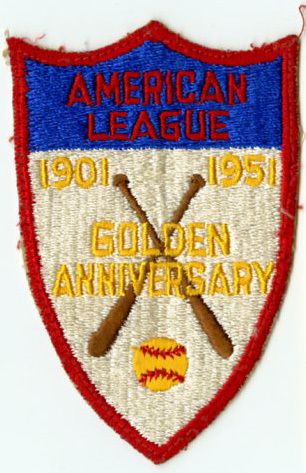 And compare it to the patch NL teams wore in 1925 to celebrate the National League's 50th anniversary (below). [This 1925 patch is a 1990's or early 2000's reproduction, niot an actual patch from 1925.] By comparison, the 1951 NL patch seems a bit out of place - it would be fun to know the story behind the design. Allow me to make one guess about the 1951 NL patch. 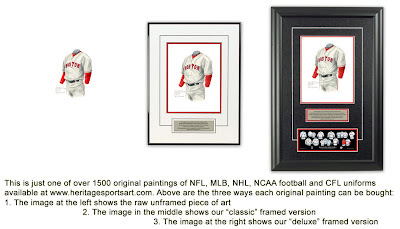 The NL started in 1876, and as noted above, they celebrated their 50th anniversary in 1925. By that same reasoning, they should have celebrated their 75th anniversary season in 1950, not 1951. But my guess, and that's all it is, is that the NL and AL jointly decided to celebrate their respective anniversaries in 1951 - 50 years after the AL's first season and 75 years after the NL's first season. It's splitting hairs, of course, but it really boils down to when you wish to celebrate a 50th birthday - in the year you are going to turn 50 or in the year after you turn 50. In 1951, the NL and AL chose to celebrate their joint anniversaries in the season after they turned 75 and 50 respectively. Thanks again to reader Jim McDonnell for bringing this info to light. Even more important than the patch...“The Giants win the pennant!!! The Giants win the pennant!!! The Giants win the pennant!! !” The New York Giants had a 16 game winning streak this year. At one point they were 13.5 games behind the Dodgers, but finished the season going 98-59. The energy that sparked the Giant performance was none other than rookie Willy Mays, and led by the Giant manager Leo Durocher. The Giants caught the Dodgers and forced a playoff. The Giants won off of Bobby Thompson’s long bomb that brought in three runs, in the bottom of the 9th of the 3rd game. Their elation was short lived however; the Yankees won another World Series in 6 games. Nothing will ever take away the amazing performance from the underdog team that won their pennant after an unforgettable series. 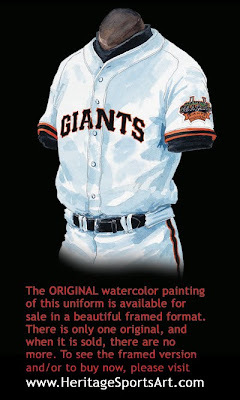 As we see on this home uniform, even though the Giants have a new home, the jersey has stayed the same. It is a very classic design with very little piping around the collar and sleeves. The Giants left New York in 1957 in tandem with the Brooklyn Dodgers. The Giants went to San Francisco, and the Dodgers went to Los Angeles. New York city went from 3 teams down to 1. They played their old neighborhood rivals the Yankees for the World Series but were overcome in the 7th game 1 to 0. The New York Mets started as a franchise this year and to honor their predecessors they chose orange for the Giants and blue for the Dodgers, a color scheme that is still in effect today. 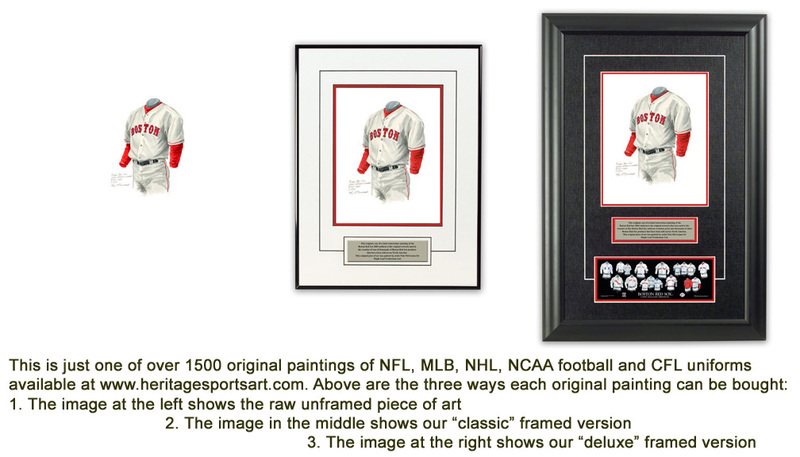 1962 is the 3rd season that the Giants are playing at Candlestick Park. The players would wear heavy undershirts or windbreakers under their jerseys because of the close proximity of the park to the ocean. Even in the heat of summer the park had a nasty chill to it. However, this did not stop the team from winning, as they go 103-62 on the season. This road jersey is a testament to how simplicity works. Little or no useless details, just letters, stripes and buttons. 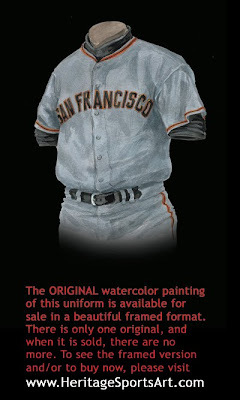 Traditionally a baseball teams’ road jersey is darker than the home, as well it will say the teams city on the front. These two clues makes telling the road from the home jersey a lot easier. The Giants finish the season in second place only two games behind the Dodgers with a record of 95-67. Willie Mays wins his second National League MVP award as he leads the league in home runs with 52 and leads the Giants with a .317 average and 112 RBI. On the mound, Juan Marichal leads the Giants pitching staff with a 22-13 record. This is a double knit 3rd jersey that most of the other teams succumbed to during the 70’s and early 80’s. It was a pullover style, synthetic material. The pants were called “Sans-a-Belt” because of the elastic material of the waistline. This is the 2nd year that the numbers appear on the front of the jersey. Uniform numbers first made their appearance on the front of a uniform in 1952 - the Brooklyn Dodgers were the first team to wear uniform numbers on the front of their jersey. The Braves followed suit in 1953, and the Reds joined in beginning in 1956. The 1916 Cleveland Indians actually wore a uniform number on their sleeve, but it wasn’t until the ’52 Dodgers that the number made it to the front. The Giants finish the season third in the NL West, 6 games behind the Dodgers with a record of 89-73. Jack Clark led the Giants at the plate hitting 25 homers and 98 RBI. Vida Blue led the team in wins with a 18-10 record. Thank goodness, the double knit of the 70’s and 80’s is over. The S.F. monogram started in 1983 on their road uniforms, and lasted until 1992. The patch on the left sleeve is “the Battle of the Bay” for the 1989 World Series against the Oakland A’s, and depicts the span of the San Francisco - Oakland Bay Bridge, not the Golden Gate Bridge as I had previously written. Thanks to reader Calixte who wrote to me in July 2015 to tell me that my previous reference to the patch depicting the Golden Gate Bridge was incorrect. Calixte wrote: "I thoroughly enjoyed reading your article on the history of my ball club, but noticed a small error. The bridge in reference to the Battle of the Bay is the SF-Oakland Bay Bridge, not the Golden Gate Bridge. The Golden Gate connects the Marin headlands to the north with San Francisco, not Oakland. With a 92-70 record, the Giants take the NL West by 3 games over the Padres and face the Chicago Cubs for the NL Pennant. The Giants take the series 4 games to 1 and go on to face the Oakland A’s. The 1989 World Series wasn’t going well for the Giants, they had lost their first 2 games, and before the start of game three an earthquake rocked the Bay Area, causing minor damage to Candlestick Park, but major damage to the surrounding areas. The game was postponed for ten days. The time off didn’t help the Giants at all as the A’s won the next two games to sweep the series. This Giants home jersey is similar to the 1962 uniform. The script is a little bolder, but the white, black and orange are still in tact. The patch on the left sleeve is the “Tell it Goodbye” patch. The team paid its last respects to Candlestick Park that was soon to be torn down. This would be the last season the Giants would play in Candlestick Park and they would move on to Pacific Bell Park, aka PacBell Park (later known as SBA Park and now known as AT&T Park) for the 2000 season. The Giants are led by Barry Bonds who hits 34 homers with 83 RBI, Ellis Burks who hit 31 homers and 96 RBI, J.T. Snow with 24 home runs and 98 RBI, while Jeff Kent hits 23 homers and drives in 101 RBI. The team makes a run for the NL West, but key injuries to Bonds, Burks and Kent slow the team down as they finish in second place behind the Diamondbacks, going 86-76. “Bonds, Barry Bonds.” This was the answer most people in San Francisco would give if you asked why the Giants were so successful in 2002. In 2001 Bonds set the single season homerun record with 73, surpassing the 70 dingers that Mark McGwire hit in 1999. In 2002 Bonds would have another monster year, repeating as NL MVP (this would be his 5th MVP Award, he previously won in 1990, 92, 93, 2001) while leading the league in batting average at .370 thanks in part to an incredible .582 on-base percentage. This mark would give Bonds the all time record in this category. He would surpass the record in 2004 with a .609 OBA. He also hit 46 homers, finishing the season with 613 career dingers, in the process becoming the 4th player in baseball history to hit 600 career home runs (Henry Aaron is 1 with 755; Babe Ruth 2 with 714, Willies Mays 3rd with 660). The Giants would battle the Arizona Diamondbacks for the NL West crown, but would ultimately fall 3 games short of the Division title. However their 95-66 record was good enough for the NL Wild Card berth and a 1st round shot at the Atlanta Braves. In the playoffs Bonds would lose his reputation that he could not win the playoffs as he hit 3 home runs in the NLDS as the Giants stunned the Atlanta Braves in 5 games (3-2). In the NLCS Bonds continued to be a threat driving in 10 runs. Ultimately, it was C Benito Santiago who was the NLCS hero. He hit .300 and drove in 6 runs to win the NLCS MVP as the Giants beat the St. Louis Cardinals in 5 games (4-1). In an all-California World Series, the Giants met the upstart AL champion Anaheim Angels, they like the Giants were vying to be the second Wild Card team to win the World Series (the 1st was the Florida Marlins in 1997). In Game 1 in Anaheim the Giants emerged with a 4-3 victory on Bonds got the Giants off to a fast start with a 2nd Inning home run. Game 2 would be a wild affair as the Angels even the series with an 11-10 win. Bonds would go deep again hitting majestic shot in the 9th Inning. The series shifted to Pac Bell in San Francisco and the Giants lost 10-4, despite another Bonds homer. After falling behind early in Game 4 the Giants would rally to win 4-3 to even the series. Carrying the momentum on the Giants would take a 3-2 series lead with a dominating 16-4 win. Back in Anaheim for Game 6 the Giants appeared to steam rolling towards their first World Championship since moving to San Francisco, as Barry Bonds hit is 4th series HR, as the Giants held a 5-0 in the 7th Inning. However, the Angels would stage an incredible rally scoring 6 runs in the 7th and 8th innings to force a 7th game. Disheartened the Giants would fall in the series finale 4-1. Despite the disappointing loss Barry Bonds had an impressive series with an incredible .700 on-base percentage, 4 home runs and 13 walks, a World Series record. 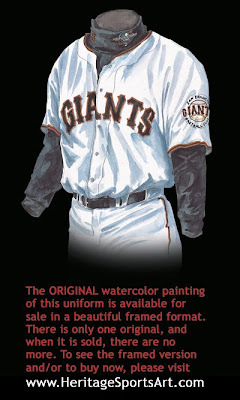 At home in 2002 the Giants would wear their classic white uniform with the team’s nickname spelled out in the script used throughout the history of the franchise. The script has an accent of gold to go along with the customary orange and black. 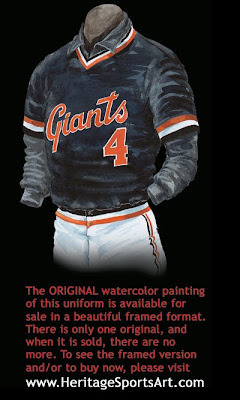 Pictured here is a Giants road gray uniform with a black low-turtleneck undershirt with the Giants name embroidered on the turtleneck. The right sleeve features the 2007 All-Star game patch in honor of the All-Star game being played at AT&T Park. 2007 was a transition year for the Giants – it was Barry Bonds' final season in Major League Baseball, a season in which he eclipsed the career home run record while facing mammoth controversy on a daily basis – and it was a year when the Giants management made the decision to introduce alot of youth into the lineup. So while the Giants last place record of 71-91 may seem to make the 2007 season a write-off, it was actually the beginning of a new team and new era, the post Barry Bonds era. Point of order: "The Battle of the Bay" was a reference to the two sides of the Bay Bridge Oakland and San Francisco. The two sides of the Golden Gate Bridge are San Francisco and Sausalito.